Despite the slow roll-out of safer streets for bicycling compared to cities like New York and Chicago, San Franciscans are making nearly twice as many trips by bike today as they did in 2006, according to a new count released by the SFMTA. Still, city leaders must significantly increase the paltry amount of transportation funds devoted to bicycle infrastructure in order to reach the SFMTA Bicycle Strategy‘s goal of 20 percent of trips by bike by 2020, according to the City Budget Analyst. As we’ve reported, bicycling has skyrocketed in the most bike-friendly neighborhoods like the Mission and Hayes Valley, where over 15 percent of commuters already get to work by bike, according to the 2010 census. As of 2012, bicycling comprised 3.8 percent of commute trips citywide, according to the SFMTA. Commute trips are only a fraction of overall trips and may not represent overall bike mode share. Between 2011 and 2013, bicycling increased an average of 14 percent at 40 observed intersections, according to the SFMTA’s new report. At 21 intersections where the agency started counting bikes in 2006, the number has increased 96 percent within the full seven-year period. At Fell and Scott Streets, where protected bike lanes were installed on three blocks Fell and Oak Streets, bike traffic has increased 52 percent. At Page and Stanyan Streets, where bicycle traffic signals and a bike ramp were installed at the entrance to Golden Gate Park, bicycling increased 78 percent. In addition, Lower Market Street, which has seen bike lanes improved with posts, green paint, new pavement, and a digital-display bicycle counter near Eighth Street, gets up to 3,000 bikes per day on average (no previous count at that spot is available). Every year we are seeing more people riding a bicycle in San Francisco, and the latest bicycle count data proves it. With an increasing amount of people riding bicycles, we must continue to ensure improvements are made to increase the safety, connectivity and convenience of our city’s bike network. With bicycling becoming more commonplace in San Francisco, we must meet and support the rising demand for better bikeways. But as highlighted at last week’s hearing called by Supervisor Eric Mar, the SFMTA has nowhere close to the amount of funding or staff it needs to roll out the protected bike lanes and traffic-calmed routes envisioned in its Bicycle Strategy. While the “System Build Out” scenario backed by the SFMTA Board would bring bicycling up to 20 percent of all trips and require an estimated $580 million, the agency is struggling to finance its more modest “Strategic Plan” scenario, which could bring bicycling up to 8 to 10 percent of trips by 2018 at a cost of $191 million. Currently, SF spends $9.16 per capita on bicycling, compared to Amsterdam (where a majority of trips are made by bike), which spends $22.44, and Minneapolis, Minnesota, which spends $12.72 — the highest in the U.S., according to the City Budget Analyst. Seattle and Portland spend around $10 per capita on bicycling. The most concrete proposals to increase local bicycle funding in SF come from the Mayor’s Transportation 2030 Task Force. Several of its proposed measures to boost funds for transportation could head to the ballot next November, but at the most, they would still only provide about half of what’s needed for the SFMTA’s “Strategic Plan” scenario. With a record number of San Franciscans killed while biking in the past year, Mar said he was “pissed off” that SF isn’t doing more to make its streets safer. And a November poll showed that a majority of San Franciscans think that improving conditions for bicycling to make it a more inviting mode of transport should be a high priority. Read more from the hearing from the Bay Guardian and the SF Examiner. 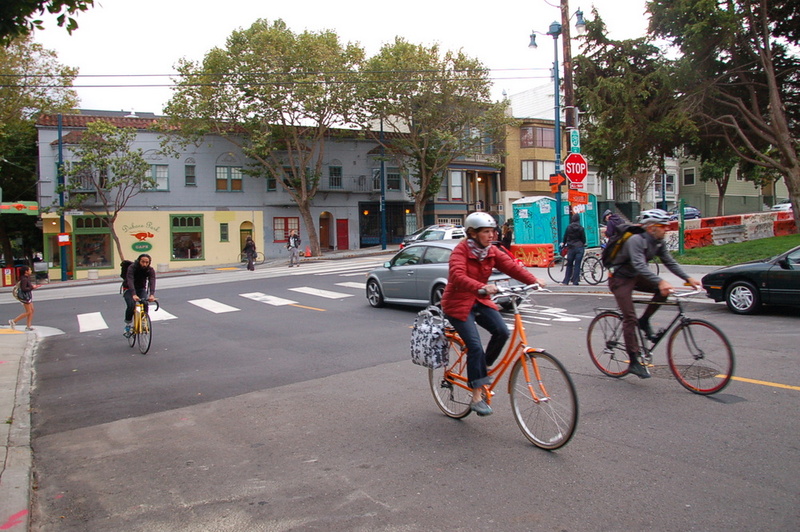 The 2013 Bicycle Count Report can be found on the SFMTA website. Great news, though it’s sad to see SFMTA continue to push helmet-wearing as a meaningful measure of a successful bicycle transportation system, if anything there’s a reverse correlation (let’s see the stacked-bar comparisons with Copenhagen and Groningen and Barcelona, dramatically higher bike mode share = dramatically lower helmet use). Today’s Examiner story picks up this helmet nannyism and adds to the irony with its front-page story about gun violence, no mention of increased use of flak jackets at SF grade schools as part of the gun safety campaign. As SF bike share use grows, stand and count the helmets on BABS users and ask yourself which you’d like to see more of, bike trips or styrofoam hats? My BABS bubble has burst. When I first started riding them, most drivers gave me wider than normal berth. Now I’m getting buzzed on the regular, nearly as much as when I’m on my road bike w/ a helmet. Drivers don’t care, we are just obstacles, like the teevee said. We need not just buffered lanes, but buffered protected ones. Just spent 4 days biking in Sydney, Australia. Worst city biking I’ve ever experienced. Frightening. Almost no bike lanes and no space in narrow car lanes. Speeding, nearly 100% ped right of way violations! totally entitled drivers, 99% compliance with mandatory helmet law, 90%+ of all riders males in their 20s and 30s. I, a rider for 45 years, a former SF bike messenger, spent more time walking bike or riding on sidewalk than any time in my life. Helmets are not the answer. We’re spending a little less than half of what Amsterdam spends, but we’re getting only a fraction of the benefits. Is that because we’re playing catch-up, while Amsterdam already has most of their bike infra assets in place and does mostly maintenance? SF spends about 40% what Amsterdam spends, and though I bet it is partially due to what you describe, I wonder if the amount of time planners and engineers in Amsterdam spend on public and bureaucratic process is anywhere near what is spent in San Francisco. Also, based on my experience riding in Amsterdam, the typical bikeway is a narrow street with speed humps along a canal and with no traffic controls at most of the intersections. Pretty low cost and really enjoyable to ride! Makes no sense to keep comparing ourselves with great cycling cultures, apart from learning from their practices. We here have what we have and just have to move things forward. Abroad, they don’t have to pay for the justifications, delays and cover-our-butts tactics necessary to allay the massive obstructions, i.e. lay people feeling entitled to demand no change. Plus, the EU had a huge historic advantage in that cycling and walking culture was reinforced post-war when cities were economically/physically decimated and petrol was way to costly. Initially easy, then artificially cheap, petrol allowed the car culture to dominate here and elsewhere. Agreed! I lived in Sydney for 10 years and though a lifelong cycling commuter, while there, I only cycled far away from anywhere. Very aggressive such that even driving was hairy. As a pedestrian even at flashing beacon zebra crossings, it’s necessary to stop and make eye contact and even then, hope for the best when crossing while cars behind the lead car honk irritably. Ped crossing lights are often not long enough for even this sprint-walker to get through safely. Melbourne is a lot better but also has trolleys and other mitigating factors. I posted previously that there’s no percentage in comparing ourselves to anywhere else, but nice to keep in mind that there are places that do trail us – in many ways, not just cycling. and on lower volume streets, VERY visible, impossible-to-ignore striping through intersections, too.